In some 300 locations in both Northern Ireland and the Republic of Ireland, the faithful gathered on Sunday afternoon, the feast of Christ the King, to ask God through Mary’s intercession to protect the faith of the Irish and to safeguard the lives of unborn children. 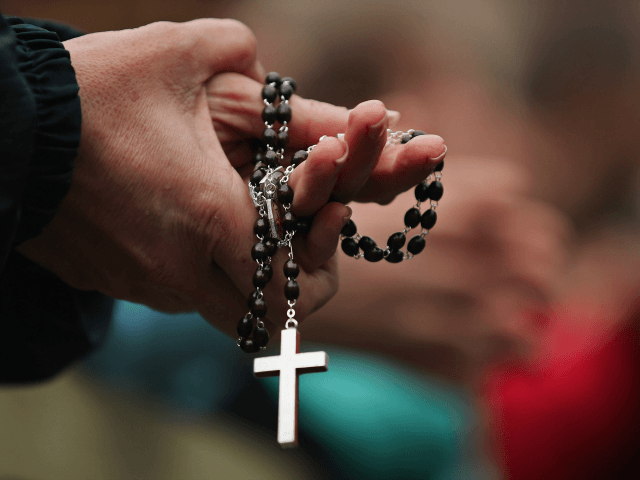 Organizers have touted the gathering—billed as the Rosary on the Coast for Life and Faith—as unprecedented, suggesting that it may have been the largest religious event of its kind in Ireland for almost 40 years, since Pope Saint John Paul II traveled to Ireland in 1979. Earlier this month, pro-life activists across Ireland went door-to-door to urge their compatriots to save their country’s 8th Amendment and to protect mothers and babies from abortion. Next summer Ireland will face a referendum challenging the Constitution’s recognition of the right to life of unborn children, and in response many headed to the borders on Sunday to ask the Virgin Mary’s intercession to keep Ireland pro-life. The eighth amendment to Ireland’s Constitution was adopted on Oct. 7, 1983, the feast of the Holy Rosary, the very day that Poland held its “Rosary on the Borders” prayer campaign earlier this month. The rosary prayer was also intended to underscore the importance of faith among Ireland’s citizens, particularly the young. The different congregating points around the circumference of the Island were meant to “encircle Ireland with a human rosary,” with the different clusters of pray-ers representing each “Hail Mary” prayed during the rosary. Abortion advocates have targeted Ireland’s pro-life Constitution since it represents one of the last bastions of legal defense of the unborn. Last year, DCLeaks.com revealed that billionaire George Soros had unleashed his powerful Open Society Foundation (OSF) on Ireland with the intent of legalizing abortion at all costs. The Irish prime minister, Leo Varadkar, has announced that the national referendum on the eighth amendment will be held next May or June. Pro-life campaigners have complained that the ballot is poorly timed it would fall just before the visit of Pope Francis, who is scheduled to attend the World Meeting of Families in Dublin in August 2018. Mr Varadkar, Ireland’s first openly gay prime minister, has described the eighth amendment as “too restrictive” and has also said that it was having a “chilling effect” on doctors. Ireland’s pro-life laws have also been assailed by the United Nations, which has demanded that the predominantly Catholic nation repeal the Eighth Amendment to its constitution. For years, the UN has had Ireland in its crosshairs for its unwillingness to allow women to abort their babies, except when the mother’s life is in danger. Earlier this summer, Ireland’s annual “Rally for Life” in Dublin drew some 70,000 marchers, who called for the protection of the Eighth Amendment to the Constitution.